Take a look at Riva's sunset on Thursday evening during the offshore. Sampaquita 2 has finished! They crossed the line at 7:24:25 this morning. 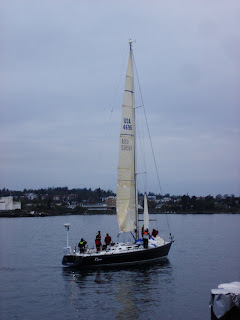 They finished with a reefed main and a storm jib, but the jib was (probably purposefully) not doing much! We also heard from Rattler, they are now safely in Port Angeles after withdrawing yesterday afternoon. Final race results will be posted here after the announcement of the results at RVYC today. We just heard from Aja, who has come through Race Rocks. Conditions there are blustery with winds out of the west at 20. Everyone is healthy - yay! Rya is 7 miles from the finish with winds of 25-30. All's quiet now at RCHQ (except for the wind) since all cruise ships have left. If I get a vote, Velocity wins "Most Exciting Finish" for dodging 3 cruise ships in the dark and entering the harbor between Cruise Ship 2 and Cruise Ship 3's exits. Velocity checks in from about a mile out. 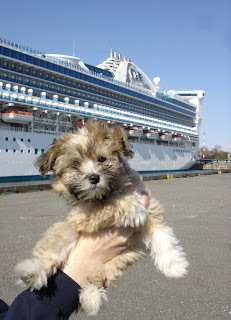 Meanwhile, 3 cruise ships are leaving the harbor and I hear Velocity on the radio making sure they know he's there. In screaming winds and with no jib, Wy'East flew across the finish line tonight at 22:02:23. There must be a story behind the missing jib, but we don't know what it is quite yet. Wy'East is the last of the boats that have reported so far from Race Rocks, so we don't know how far out the remaining five boats are. The last boat to finish, Wy'East reported to VTS at 7:25 am this morning, so she passed both Rya and Velocity during the day today. The winds are heavy enough at the finish line right now that the RC's heavy 30' fifth wheel is rockin' & rollin'. Giant Slayer has finished in grand style, across a finish line with lots of whitecaps. They finished Saturday night at 21:40:51. Just got a call from Wy'East. They are about 4 miles out and have an eta of about 10 pm tonight. Rauzer II finished at 20:32:27 tonight. They were looking good as they flew through the finish line. At 8:23 Giant Slayer called, they are at Race Rocks and heading towards the finish. 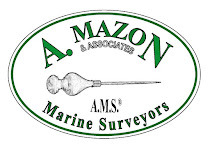 We just heard from Rauzer II, they are coming through Race Rocks at about 7 knots, looking to see us soon. Winds and rain have picked up significantly. Wind is blowing at about 10+ knots and rain is coming down hard at the finish line. At 6:49 pm, Kokomo called to tell us they were coming through Race Rocks. We hastened to finish our dinner and rode our bikes, in the rain back to the finish line, where we await Kokomo's finish. We have three cruise ships sharing the docks with us, one of which is preparing to leave - and will probably leave at about the time that Kokomo gets here. Shortly after Mummbo Jummbo's call, Peulche called. They were motoring through Race Rocks because of the lack of wind. Just after the call from Peulche, Passepartout also abandoned the race, approximately 1 1/2 miles from Race Rocks. At the time of their call, they were not sure whether they would be stopping in Victoria. Passepartout told us that the weather at Race Rocks was rainy, with visibility of about 1/2 mile and no appreciable wind. 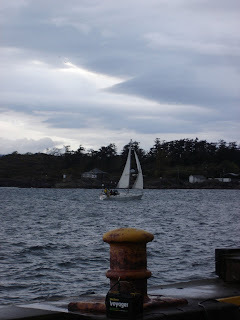 They said that they had really had no wind since Cape Flattery. What wind there was, was not steady enough to do anything. 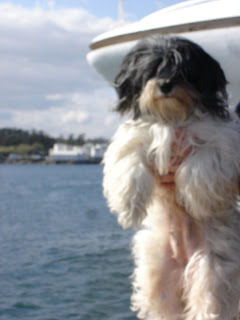 There were some other boats with them at Cape Flattery when they left by motor. At 5:16 pm, we received a call from Mummbo Jummbo dropping out of the race. At the time they called, they were about 3 miles from Race Rocks, but said that they had been drifting ever since turning the corner. Their motor is on and they are heading towards Victoria. With no word from anyone near Race Rocks, RC is off to dinner. Last year this triggered several calls of boats approaching Race Rocks and required Lynice to dash back to the finish line while Sue waited for take-out. Let's see if that works this year. Just got a phone call from Aja. They have just turned the corner. Wind is currently ESE at about 5 knots and it is raining. They have heard radio traffic from Sampaquita 2 who is approaching Duntze Rock. They said that there is another boat out there with sails down, but they are not sure what boat it is, or if it is even one of the racers. They are looking for that stronger west wind that has been predicted all day. Spinnaker down, Riva heads for Ship Point and a well deserved rest. Here we have Time Bandit and Riva as they run for the finish just outside Ogden Point at about 4:45 am this morning. Race Rocks has a viewer controllable webcam that shows the area around Race Rocks. If you are lucky, you might be able to see one of the racers heading through. (Not that we have anyone heading through there in the immediate future). Thanks to Gary, we've added an interesting link to real time buoy reports at the top of our list for your viewing pleasure. Legacy has checked in with Seattle VTS at 8:40 am this morning, leaving only Aja and Sampaquita 2 left outside. It's been a very quiet morning, although the winds have started to pick up a little (maybe 6 knots or so at most here at RC) the flag is fluttering a bit right now and there are cats paws on the water. 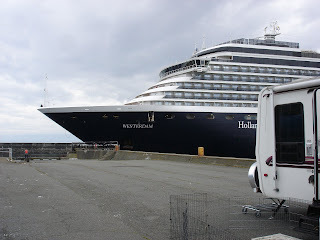 One of the five cruise ships expected in Victoria is berthed, the remaining 4 have not yet arrived. At 9:40 am this morning, Mike Campbell from Rattler withdrew from the race. They made it around Cape Flattery, but the wind died and the tide was causing them to be swept out to sea. They have fired up the engine and are motoring to Pt. Angeles. Frank called to report their position. I thought he said 48'25"N, 144'36"W, but I found this tool where I can plot a position: http://itouchmap.com/latlong.html and based on that, I think he must've said 124'36"W...I hope. Anyway, it's gray and calm here at RCHQ, but Frank said he had a windspeed of 5 and boat speed of 4.6 - Go Wy'East! They made it - and the finish line flag is barely moving. Good job, Riva! Just heard by radio from Time Bandit, they are at Race Rocks. 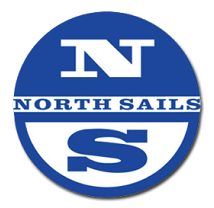 Our thanks to Schooner Creek and Brian Hallett at Navigation Solutions, RC's newly installed VHF radio is working well and we've been able to communicate with boats at Race Rocks and with the hospitality boat, Total Eclipse at Ship Point. Now, if we could just get the cell phones to work as reliably. On one side of the trailer, our cell phones say they are getting "service" from AT&T, on the other side, the "service" is from Rogers... neither works very reliably, and at night, they are worse. As of 2:35 am Saturday morning, Riva is at Race Rocks. They have about 4 knots of wind. ETA to finish is several hours away unless the winds pick up. Here inside Ogden point, the RC flag is just hanging on its pole. At 22.40.39 tonight Rage ghosted across the finish line in very light air with her chute barely filled. The wind has become steadily lighter this evening and Rage took a bit longer than predicted to make the line. Kokomo just checked in. They are at 124'40" and have passed 48N some time in the past. They are currently about 10 miles from Duntze Rock. Rage arrived at Race Rocks at about 20:41 tonight. We expect to see them arrive at the finish soon. They are doing 9.2 knots and hoping the wind picks up. It has picked up at the finish line. Rage was at Sheringham Point at 7 pm, according to Nancy Rander. They expect to reach Race Rocks at around 9pm. Weather here in Victoria is turning a bit overcast as the clouds come in from the Pacific. Winds have remained light all day. Right now our view out the RC window shows a flat, almost windless bay with the sun slowly setting into the clouds. At 7:25 pm Tom on Velocity called to let us know that they have crossed 48N. Winds are light, about 6 knots out of the South West. Rage is now 3 hours from Race Rocks, so we will expect to see them arriving at about 11 pm or so tonight. We have one cruise ship that is docking now and should be here until after Rage arrives. Finally, Diva, mother of the tequila crew, and our most reluctant RC member, refusing to pose for a photo, she was out of here! These three guys are the youngest members of RC. 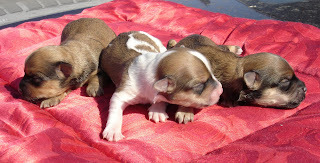 They were born on Monday - right to left, we have Margarita (girl), Patron (boy) and Tequila (girl). Note - Monday was also Cinco de Mayo. Latest update from Legacy. They (and several other boats) were becalmed for about 4 hours this morning. They are now underway again. Passepartout is on the horizon in front of them and another boat is on the horizon abeam. At about 2:45 pm, they were about 18 miles from Destruction Island. RC now has working internet at the finish line, so we should be better able to get our updates filed promptly. Cheers! 10:30 am. Time Bandit has crossed 48N. Phone connections with them were terrible, so that's all we got. RC is sitting in the sun on the dock drinking our morning coffee. We are still trying to get our internet connection on the dock working. Winds at Victoria are light and the sun is blindingly bright for those of us used to Portland's overcast. We are heading to RVYC to get a new DSL modem that has already been configured for the line at the dock. With that modem, we hope to be able to get our posts up as soon as we hear from the boats. The previous posts have all been made from RVYC, so they have to wait until we are there to do the posting. Rage is 20 miles from turning the corner. They have Time Bandit on the horizon behind them. Winds are light. Weather is sunny. 9:30 am report from Tom English on Rauzer II. They are at 47'30" N 124.3 W (near Destruction Island). It is nice and sunny with light east wind. They saw a "herd" of wales about 1/4 mile off the boat a couple of hours ago. They have a couple of boats in sight, one abeam of them 5-6 miles away and another about 8 miles out from them. The boat 8 miles out is running a chute. 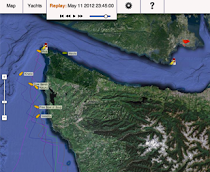 All of these boats were about 20 miles south of Grays Harbor. 2:30 pm Rage is just off Willapa Bay with winds at 8-10 knots. Says they are moving right along, but not at a breakneck speed. Wy'East was a bit late to the start after spending 30+ minutes in the sand before making it out to Buoy 2. RC has heard that a few others also spent some time in the sandbox, but managed to get off earlier than Wy'East. Legacy pulled one as yet unidentified boat from the sand. The race started on time with 16 boats, including late entry Passepartout. This is the finish line's attempt to make info about the Oregon Offshore available to friends and family who are not out on the race course. 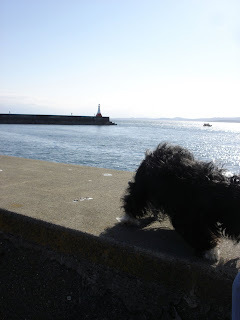 We expect to have internet access at Ogden Point, so we will experiment with this Blog as a way to give folks info about the race as it happens. We will try to post information about boat check-ins as we get them. We will also post any stories about the race and the boats that we get. Please remember that under the Racing Rules, you are not allowed to give any of this information to the boats that are out racing, since this would be considered "outside assistance", which is not allowed and which could cause a boat to be disqualified.